Could a dog be your workout partner? A poster, advertising classes for people to get fit with their dogs, had hung in the window of Kirsten Cowling's dog grooming business for a year before she finally took the plunge. "I'd hit rock bottom," she says. "I'd got fatter and fatter, I could feel it in my health. One of my dogs had been very ill and I'd nearly lost him. "I needed something to get him fit and that finally shoogled me in the right direction." The 49-year-old describes the experience of turning up to her first session with Lindsay Johnson, who runs fitness training company Cani-fit, as "awful". "It was really hard to do it," said Kirsten, who has two Border Collies, Leo and Splash. "I puffed and pecht my way round the park and when I finished I was a heap. "But when I went home I had a grin from ear to ear, and my dogs loved it." That was 18 months ago. I'm now standing in a car park with Kirsten and Lindsay waiting for my own first experience of exercising with a dog. It's a beautiful evening in Eglinton Country Park in North Ayrshire and tails are wagging frantically as about 20 dogs and their owners gather to take part. 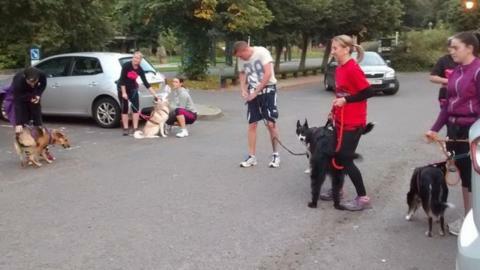 Lindsay has devised her fitness classes around the sport Canicross, which is cross-country running with a dog. She complements the trail running (or power-walking) with other fitness exercises for both the dogs and owners. Lindsay gives me a special harness to wear and Kirsten then attaches me to her dog, Splash, via a two-metre bungee-cord. The dogs can sense that the session is about to start, and the whining and barking gets louder and louder. It's hard not to get caught up in the dogs' fevered anticipation. I feel more excited and nervous than at the start of any running race I've ever taken part in. I have to hold on tightly to Splash who's clearly raring to go. Before I have time to change my mind we're off. Or at least Splash is off, and he's pulling me along behind him. Kirsten runs beside me with Leo. The dogs are both totally focused on the task in hand - running and listening for Kirsten's basic commands. I run further and faster than I ever would usually contemplate, partly because I feel I owe it to Splash who is clearly in his element. But I'm also persevering because Splash is gently pulling me along - which is an absolute luxury when we start heading uphill. Kirsten kindly suggests I rest during the sprint section of the lesson. But when Splash starts whimpering, I feel I can't let him miss out. Before I know it, we're back in the car park and the dogs are packed off into cars to cool down with some water and a treat. However, it's not over for us humans - we're put through a short strength and condition session followed by some stretches. Cat McLure, 37, says the sessions have helped her bond with her rescue dog Sasha, as well as deal with work-related stress. She explained: "Sasha sees her harness coming out and she goes nuts! "And doing this keeps me calmer, it helps me get out at night and it clears my head a bit." For 24-year-old Craig Shane and his dog Misty, it's the first time they've come to a session. "I used to run with Misty, but I'd have a lead in one hand and a bottle in the other," he said. "Using a harness and being part of a group is much better." Lindsay tells me that the sessions are for anyone who want to do something fun with their dog. "We've got people who are 50 plus, we've got boys who are 11 and 14," she highlighted. "We've got all breeds from King Charles Spaniels to Border Collies to Malamutes. "You don't have to be fit to take part - there are sessions for all abilities. We'll look after you." And if you need another good reason, you only have to look at the dogs who take part. "Just look at Splash," added Kirsten, "He's just all smiley-faced and happy." He's certainly the most motivating exercise partner I've ever had. For more information about getting more physically active, take a look at our Get Inspired guides to find an activity for you.